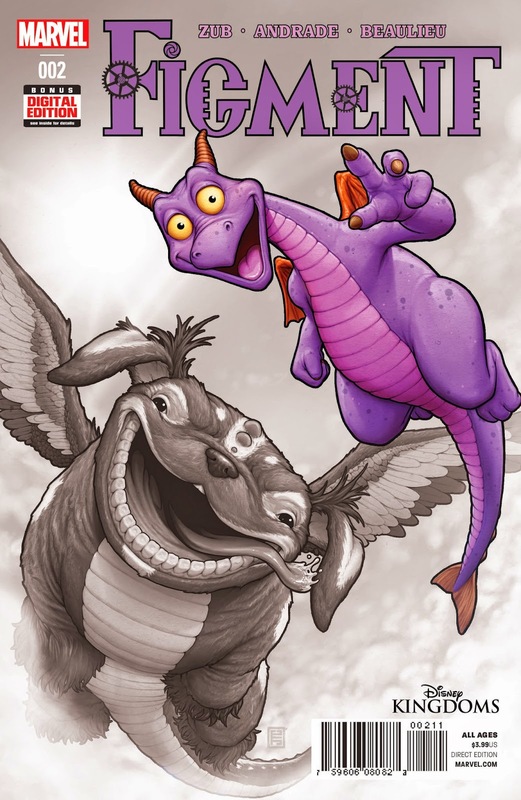 FIGMENT #2 Sparks a Second Printing! Everyone is buzzing about FIGMENT! Hot on the heels of the critically-acclaimed first issue selling out and generating a second printing, Marvel is proud to announce that FIGMENT #2 has also sold out at the distributor level before it’s even released! FIGMENT #2 will head back to press and is available for order immediately. Fan-favorite writer Jim Zub (Skullkickers), artist Filipe Andrade (Captain Marvel), and colorist Jean-Francois Beaulieu continue their journey into imagination that has fans raving as they reveal the never-before-told origins of the enigmatic inventor known as Dreamfinder and his purple dragon companion Figment! Don’t miss your chance to see what’s sparked the imagination of readers all over the world and why FIGMENT is perfect for Disney and Marvel fans alike! Catch up on the magic of the acclaimed first issue and snag a copy of FIGMENT #2 when it returns to comic shops later this month!